If you have blood vessel or heart disease, or if your blood flow is poor, your doctor may recommend you take blood thinners. When prescribed new medication, it is important to talk to your doctor about possible food interactions with the medication. The salicylates and vitamin K in blueberries can affect the way certain blood thinners work. Blood thinners are medications prescribed by your doctor that help reduce the formation of blood clots in your arteries and veins, which reduces your risk of having a heart attack or stroke. Blood thinners are most often prescribed to individuals with an abnormal heart beat -- referred to as atrial fibrillation -- or people who have had heart valve surgery or individuals with congenital heart defects. Blood thinner medications fall into two categories, anticoagulants and antiplatelets. Anticoagulants include medications such as warfarin and heparin, and work by lengthening the time it takes your blood to clot by interfering with the chemical reaction. Antiplatelets include aspirin, which work by preventing platelets from clumping together to form clots. Like most fruits, blueberries make a healthy choice. They are low in calories and high in fiber and essential nutrients. A 1 cup serving of fresh blueberries contains 84 calories, 1.1 g of protein, 0.5 g of fat, 21 g of carbohydrates, 3.6 g of fiber, 114 mg of potassium, 14 mg of vitamin C, 80 IU of vitamin A and 28.6 mcg of vitamin K. Blueberries are also a natural source of salicylates. Vitamin K is a fat-soluble vitamin that plays a very important role in helping your blood clot. Coumadin, also known as warfarin, works by decreasing vitamin K activity so that it takes longer for your blood to clot. High intakes of vitamin K in the diet decrease the effectiveness of the medication. When taking Coumadin, it is recommended that you limit your intake of foods that contain more than 48 mcg of vitamin K per serving, such as kale, spinach or broccoli. 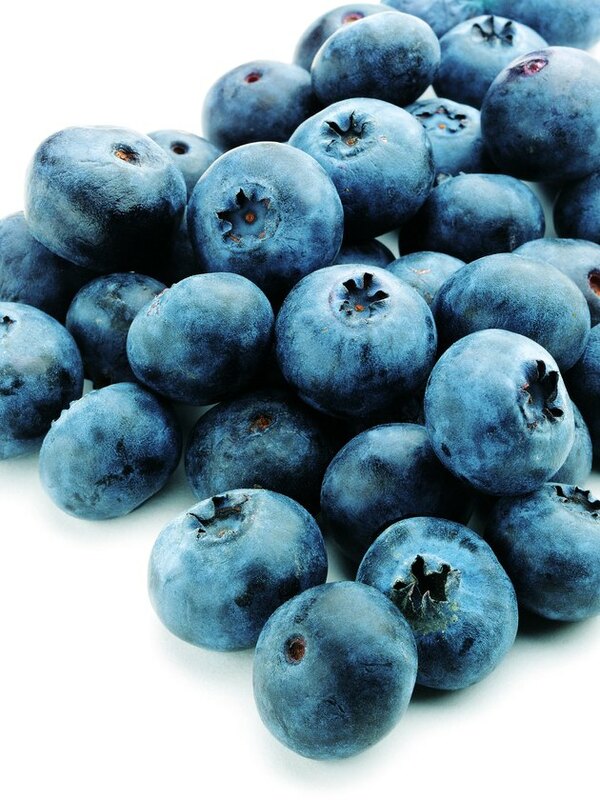 Blueberries contain 28 mcg of vitamin K per 1 cup serving. While it is important to pay attention to your total daily vitamin K intake when taking Coumadin, blueberries do not need to be severely restricted. In addition to being a source of vitamin K, blueberries also contain the natural pain relieving chemical called salicylate. This is the same chemical found in aspirin that helps reduce blood clots. The salicylates in blueberries may act as a natural blood thinner. If you are taking blood thinners, you should talk to your doctor about the effects of eating foods high in salicylates on your medication.